A report on the purported delivery of the INS Declaration on Inauthenticity—office comedy Maurice Blanchot and Tommy Cooper would’ve loved to death. Click below to download the INS Declaration on Inauthenticity. (document unavailable at this time). The International Necronautical Society’s Declaration on Inauthenticity took place at Tate Britain on the afternoon of Saturday the seventeenth of January. At least, I’m pretty sure it did. I mean, I was there. But that doesn’t prove anything. It must have happened, though. The sent-messages folder in my email has a number of back-and-forths between me and INS Chief of Propaganda Anthony Auerbach. He agrees to arrange for a press pass to be put aside in my name. He agrees (“with pleasure”) to chat to me after the Declaration is made. In his last couple of emails, his name has shrunk to an initial, a single A. It’s brisk, friendly. I take the train there, feeling important. I develop a walk—half-ponderous, half-determined—that will send out a very powerful message: This person is going to the presentation of a manifesto! A’s emails had stressed punctuality (“Arrive early”), and a large crowd loiters around the double doors of the auditorium. Some clutch manila folders and wear lanyards with neon press-ID cards. I sign in at the press desk and pick one up, but it keeps flipping over to the blank side or squirreling into the folds of my coat, so I have to keep announcing I’m a journalist to people I meet. There are sage nods. There’s that before-a-film feeling, people toying with the features of their mobiles, rocking on their heels, drawing big tuneless inhalations. At regular intervals, technical staff with chunky walkie-talkies slapping against their belts pound through the lobby wearing black INS T-shirts, looking like they’ve just completed a team-building exercise. Suited men guard the double doors, conversing in grave monotones. Suddenly, responding to some unseen prompt, they swing open the doors and we go in. At the back of the stage, there is a large screen showing a PowerPoint presentation in the sans-serif font of the international conglomerate: The INS logo swims and dissolves as “Networking Space, Constructing Craft” crawls across the screen. Below it, two faux-bois lecterns in jagged double-inverted-triangle shapes stand, empty, about eight feet apart, with the names of the speakers—INS General Secretary Tom McCarthy and INS Chief Philosopher Simon Critchley—printed on metal plaques in that same corporate font, the INS logo set in the corner. Everything is like something: the airports-and-hospitals font, the cordoned-off press area and “Reserved” stickers on the front two rows, the notebooks-out sense of imminent interest: Steve Jobs announcing a microscopic iThing, a bank declaring a name change, a policy being launched; someone resigning, someone being promoted. The International Necronautical Society’s commitment to bureaucratic procedure is obsessive in its detail and methodical to a fault: INS documents are studded with footnotes and parenthetical exegesis. The Declaration is both a declaration in the tradition of Marinetti’s Manifesto Against Past-Loving Venice and the documentation of what a declaration might be like (a “mapping,” in the INS’s favored nautical and navigational terminology). The “craft” of the PowerPoint is, then, a literal one, and the flotsam of event management—each logistical flourish code for “This really happened,” like a saintly shinbone—has become the latitude and longitude of a voyage into the unknown. Bourriaud mumblingly announces the arrival of Tom McCarthy and Simon Critchley. Necks and cameras swivel round, flashbulbs pop and flare. One goes off near my eye and everything goes blue. As the afterimage fades, I look up at the stage and recognize McCarthy—but not from the author photo on the back of my copy of his novel Remainder. This Tom McCarthy onstage, I realize, I’ve maybe met before or seen in an advert. He stands to the right, alert, even jittery, his hair in a neat side part, wearing a tight-fitting charcoal suit; Critchley flanks him to the right, a bald, bespectacled man in his fifties in a round-shouldered suit that hangs from his body. They glance at each other and begin reading out the notes on their respective lecterns—Critchley with both hands gripping its edge, intoning rather than speaking, leaning in and out as though caught in a breeze, McCarthy with his hands in his pockets reading with a stilted stop-start cadence, eyebrows sharking up and down like graphs in a business meeting. Their readings alternate, and as each speaks, the other stares across the stage, eyeing his partner with beady curiosity, waiting for the next cue. Up on the screen comes the INS’s newly designed logo, a UN-style segmented globe held in a laurel wreath, with a silhouette of the Egyptian god Anubis at its crest and an amorphous blob behind it (a sponge, the notes in the manila folder inform the reader). Emblazoned beneath the logo is the motto “Cras ingens iterabimus aequor” (“Tomorrow we shall [re]traverse the enormous space/sea”), like a line out of the Odyssey or Deep Space Nine. A few minutes in, restless audience members are already starting to shuffle in their seats. The reading becomes a kind of undifferentiated drone, a stream of pronouncements, quotations, demands, condemnations. Fingers scuttle texts to absent friends. There’s a call-and-response of giggles and coughs, as if the crowd were collectively communicating, Is this it? 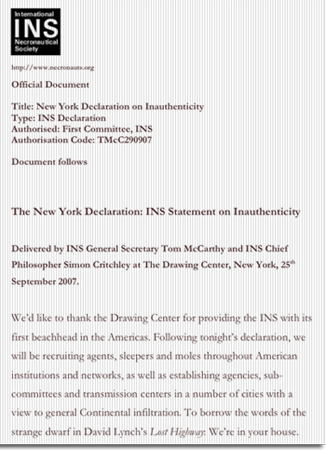 The INS Declaration (both its original incarnation at the Drawing Center in New York and this restaging, or reconstruction) sits within the British tradition of the comedy of bureaucratic procedure. The bureaucratic comedy is activated by the undoing of form by matter, the intrinsically futile attempt to organize unruly matter into rational form. Think of the spiraling vortices of disaster that occur when Basil Fawlty or David Brent or Alan Partridge attempts to control the stubborn realities of matter itself—the car won’t start, the tree won’t budge, the stain won’t shift. And the tighter matter is grabbed the better to control it, the sooner it shoots away, like a wet bar of soap. The detail—the lanyard, the stanchion, the emailed instruction—is the grip, the setup that allows the punch line to work. The guide to the underworld, it turns out, is not Virgil, but a company’s employee manual. Imagining this alternate route, I’m reminded of one of the great bureaucratic comedians, Tommy Cooper, an enormous, fez-wearing Welshman whose act consisted of magic tricks that went wrong and kept going wrong. Any attempt to remedy the situation drove him deeper into incompetence: Props snapped or misbehaved, lights failed to go on, curtains fell and rose with capricious inconstancy. Onstage one night in 1984, during the variety show Live from Her Majesty’s, he grimaced midtrick and sank to one knee, sending everyone into howls of laughter. The laughter slowly subsided as the audience realized that Cooper, now lying on the stage, was dead. Sometime midway through the Declaration, and almost imperceptibly, the audience divides itself. I turn around at one point to see an alternating pattern of goofy grins and furrowed brows—the cognoscenti and the confused, respectively. As the speakers open the floor for questioning, with INS-badged subordinates hopping up and down the steps with cordless microphones, several audience members come forward, bringing up Heidegger, Nietzsche, Warhol, Lacan, sticking on tricky words. Their sentences pile up and collapse under their own weight, eroteme-free. The chuckles become less subdued as the McCarthy and Critchley substitutes frown earnestly and consult their notes in response to the questions. I can’t believe they can’t work it out, someone near me writes on her manila folder, passing it to a friend, who shrugs. “I’ll answer your question in this way,” responds the Critchley substitute to the first question and reads out an unrelated prepared answer. Despite outright laughter, the questioners press on, beetle-browed, roll-necked, the microphones shrieking as the voices get harder and huskier. A mountain range of quizzical expressions rises and falls across the McCarthy substitute’s forehead. “I’ll answer your question in this way,” he says again. Everyone is relieved; it all worked out. The press people, the technical staff, and the rest of the INS staff slope off to the pub. In the emptying lobby, a spray of crumbs and crushed cups coat the floor and the sofas, like a punch line: “the brute materiality of the external world,” waiting around for the cleaners to turn up. “Marinetti” image: screen cap from Carmelo Bene Futurismo. Tommy Cooper image: 1984. All other images: unauthorized.